Abstract: Airwheel is bold to break traditional mode to bring innovative products to make users' life more convenient and smarter. 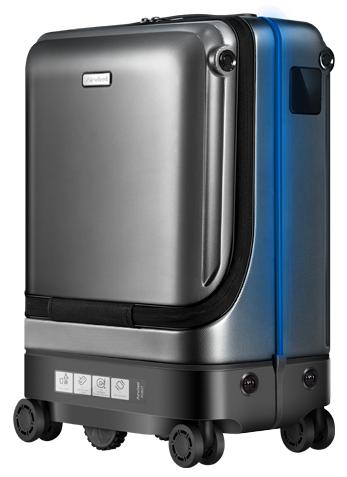 SR5 smart robot suitcase is an exemplar featuring auto-follow, lost alerts and auto obstacle avoidance and more. There are many physical and mental health benefits to gain from travelling. For some, travel is not about seeing new places, but rather escaping old ones that have a negative impact on our lives. Vacations can also help us to manage stress as they take us away from the places and activities that contribute to our stress levels. However, the luggage is unavoidable. How to travel light and smart? Here, Airwheel SR5 intelligent self-driving suitcase will give you a hand. As far as the bag is concerned, it's a 30L smart suitcase that is fully made from ABS material and hard shell PC. Airwheel handpicked the quality fabric as its inner, allowing you to put underwear directly with no more worry. The reasonable layout gives you opportunity to arrange the travel items in clean order. This sophisticated metal construction gives SR5 intelligent auto-following suitcase “super strength and durability” so it looks like the bag can take a beating. It is weighing 4.5kg (dimensions 550x380x210mm). It's also smarter as this bag has support for Bluetooth connectivity. This means that you can connect your suitcase to your Android or iOS device and remotely lock or unlock it with an app. The lock is also TSA approved so you can rest easy if you're travelling to the United States. With the visual tracking and sensor technology, Airwheel SR5 smart autonomous suitcase realizes auto-follow and intelligent obstacle avoidance. There is no need to worry about bumping into people or objects. Also, the position track and anti-lost alarm allow users to switch between auto-follow and remote control easily and safely. In case of SR5 being separated from the user beyond safe distance, SR5 installs an intelligent alarm system and itself and user's phone will release alerts to remind user. Take a holiday to travel, as it will improve work-life balance, decrease time pressure and have better mental health. Airwheel SR5 hands-free suitcase makes the holiday easier and happier. Previous：Airwheel H3S power chair: each and every feature designed has the customer's comfort and safety in mind.